Occasional posts on the day-to-day. A statement about what we gain from paying attention to Earth, how attention feeds the creative process, and the viewer’s role in fulfilling the art-object’s essential function. Humans need to connect with Earth, the site of our existence, on which everything depends. My drawings are transmissions of place that I hope will earn your attention. Because Earth has something to tell us. When I travel to a place, I take my time and give the place my full attention. I walk, sit still, listen, think and daydream. I am alone, in silence. I sketch and take notes. I return. I pay attention to atmosphere, light, and color. I see patterns that reveal an underlying order - the cracks in the limestone karst that score the grey expanse. I listen for the sound of the wind through a stone wall. Unseen things - imagined, dreamed and thought- gather around. I look for poetic empathy with place and a connection to genius loci. Over time I collect experiences, memories, material samples, photographs, field notes and sketches to create a personal archive of a place. This first-hand research is the emotional core of my creative process. As I pay attention, my connection to the place deepens. I learn the names of things. I learn the tales that are told of a place. Books and material culture embody past-place and help site me on the timeline of humanity’s brief existence. Thinking through stone and the lithic connects me to the deep time of Earth - the extra-human, the pre-human and the post-human. It is oddly comforting. In exchange for the simple practice of attention, (which everybody can do, not only artists) we experience feelings of empathy with the things - stones, volcanoes, the ocean, jackrabbits - that share this moment of existence on Earth. It leads to an appreciation of the worlds beyond self, both animate and inanimate, and a desire to protect their right to exist. Attending to Earth brings a sense of meaningful connection to the time and place where we are now, which is important: We protect the things we love. Attention brings us closer to love. I am sometimes overwhelmed by ecological anxiety. We are losing so much, and a feeling of solastalgia surrounds the things that remain - a feeling that the things I see and love in the here-and-now will soon be lost. Diving into my creative process and connecting to Earth is a way to counteract feelings of loss and hopelessness. I also gain perspective and a dose of mortal humility. I am filled with gratitude for this miraculous life-bearing planet. I make art because I have something to say about what I see and feel unfolding all around me on Earth in the year 002019. This mission feels increasingly urgent. The creative process that began by paying attention to place and receiving nature’s “transmissions,” continues in the studio. I cast about in my artist’s toolkit and set to work to articulate a visual statement about peatbogness, or about how it felt to be standing near an ancient stone fort built of stacked Burren stones, or how to tell about a color that you can walk through. I reflect, remember, trace, reframe, draw, stencil, rub, cover over, cut, remove, distill, reverse, assess, until finally an art object emerges from the process - in this case a series of drawings. This is where you come in, dear reader. An art object does not perform art’s function independent of the viewer. For a drawing to transmit its visual message, an eye/mind must first take it in. Only then, through your attention, a new thought or association, an unexpected emotion, a memory, curiosity, or a new way of understanding might happen. At that moment visual art becomes more than simply an output of the creative process. Through your attention visual art becomes a powerful image-agent of change. Northland wrap up, for now. …it has been a life-changing period for me both as a visual artist and as a human inhabitant of a beautiful and fragile planet. A blog post about a poem and my 5-year old self. Northland opens at Twenty-two Gallery in Philadelphia, May 11 to June 3, 2018. A new book edition, 71°N 23°E. The work on paper that I made in September and October are the first glimmers of an arctic imaginary that is slowly taking shape. I'm thinking about how we see nature and how nature is represented in our cultural environmental imaginary. I'm thinking about the role of the visual in our lives. I am asking how a visual image can affect the way we attend to nature, or how the visual can help forge a deeper connection to nature. My work also reflects musings on unseen things, how they loom in the imagination and color our perception of reality. Through drawings, words, memories and imaginings, Northland documents my process of attending to nature, of “seeing” nature, and responding. That process inevitably becomes a form of self-examination. We are all deeply entangled with nature. Rain on the window pane in Siglufjorður Iceland. Mountain, unseen, beyond. I am currently settling back into a studio routine, at home in Philadelphia, after a lovely, long spate of holiday and family gatherings. Needless to say it's a very different pace of working. Slower... but new work is underway. Here is a shot of the studio in North Iceland with the red flags (see this post for more on those) that I brought with me from Philadelphia along with new works in progress. Northland images at Herhusid. The three red, white, and black flags re-imagine the flag of Greenland. I have spent much of my time during this residency listening. To the sounds of nature, the sounds of the world in the here and now, and also the echo of sounds, waves of sound that travel the opposite way - sounds of self, of unformed thoughts and words, of memory. Rock fall. Longyeardalen Svalbard, Norway. I sleep, and something inside me wakes. looking for an anchor, a familiar shape. We find a place to sit and wait. We are in a rock-strewn valley. I know it by heart. Behind lies the sea, the shore, the town. Machines burrow deeper in the mine. Everything quiets. The fox turns around. In front stands a mountain that cleaves the valley. A glacier heaves its weight against the stones and splits. Time flows through us. The silence is profound. a rock falls and then… taptaptap tap tap… a cascade of stones and then… a soundless sound as sand drifts lower. bearing witness to the mountain’s disassembling, and our own. to join the ancient current of stone. 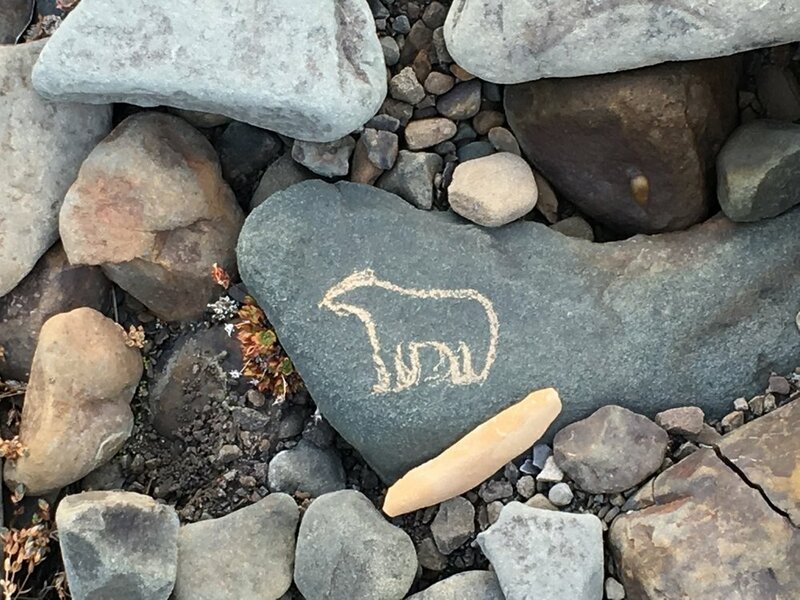 Drawing on rocks with rocks. Blog post from the Northland. Science and technology accelerate forward, delivering new capabilities to see, not only outward, to faraway places via digital transmissions, but inward, to examine the stuff of nature and existence itself. We continually extend our minds to go deeper in our understanding of the universe and our place in it. It's in our nature to do so. After all, scientific inquiry begins with curiosity and wonder, two of humanity's more endearing traits. While Einstein's revolutionary theories began taking shape in the first quarter of the 1900's, it has taken almost 100 years for them to trickle down and influence our collective imaginary of world. Today a new generation is being raised in an intellectual, cultural context that completely overwrites our previous understanding of space, time, and the nature of reality. We have not yet unraveled the mysteries of spacetime, but we know that reality is not what it seems. We grasp just enough to comprehend the vastitude of our ignorance, which is good to know, if humbling, and we persist. Art has an important role to play in this process: to convey difficult and abstract concepts, not in a direct or didactic way, but through emotion and nuance; to create new perspectives, and new contexts for understanding the complexities of our existence by bringing them to ground level where they can be seen and considered. As a visual artist, as a human, part of what defines who I am is my desire to pay attention (observe and reflect) learn, synthesize and transmit about this moment, this world, as I see and understand it. I am thinking about transmission because climate change is one of those abstract and difficult concepts. The future ramifications of climate change are difficult to grasp, but we cannot delay addressing it. How we perceive and respond to the realities of the here-and-now will directly shape the future. I believe that understanding the nature of one's connection to Nature is a fundamental and prerequisite condition for a meaningful, constructive and reality-based response to climate change. Transmissions from the Longyearbyen webcam enable me to begin connecting to a distant place in the Arctic Circle. Those mountains, the polar twilight, the whites and the grays, the midnight sun, feed my imagination and instigate a desire to know more about what I am seeing. I hope my images do the same for you. That is the intention behind my current works of visual art - to inspire curiosity, connection and exchange between self and nature. A Transmission from Svalbard in the year 002017. Unique artist's book, 9" x 7" closed, 9" x 112" extended. Acrylic and graphite on Yupo, 2017. This Fall I will begin a series of three visual arts residencies that will take place in and near the Arctic Circle. In September, 2017 I'll travel to Longyearbyen, Svalbard, Norway for one month residency at Galleri Svalbard. In October I'll travel to North Iceland for a month at Herhusið, in Siglufjordur. Then, in June 2018 I'll participate in the Arctic Circle residency, 17 days and nights on a tall ship in the High Arctic with 15 other artists and scientists whose shared mission is, in my own words, to transmit about the Arctic. Through these first-hand experiences I'll absorb, feel, inhabit, walk, dream, draw and word my way to a deeper understanding of Arctic. I'll also heave with sea-sickness, no doubt. These experiences will give me powerful tools to work with in my visual arts practice. Travel to the Arctic involves confronting an inconvenient truth: to access wild and fragile places inevitably contributes to their degradation, no matter how well-meaning the mission. I am taking this once-in-a-lifetime opportunity, and the responsibility that goes along with it, seriously. A core aspect of my creative mission is to document my experiences and transmit. If you haven't yet, I hope you'll consider joining my mailing list to receive updates about my experiences in the Arctic. New flag for Greenland, 18 x 25, acrylic on up cycled synthetic fabric, 2017. Even though it is ingeniously abstracted, Greenland’s flag “pictures” nature: the massive ice sheet, the sea ice, the low sun. But what happens to this social imaginary of Greenland when the ice sheet is gone? Or when lack of sea ice disrupts age-old cycles and opens up new vulnerabilities? Visual art, through the act of picturing, seeds the social imaginary with new ways of seeing and understanding nature. This in turn shapes how we relate to nature, and so on, in a chain of cultural transmission. I recently wrote an essay for Chantal Blondeau's Artists and Climate Change blog, excerpted above. To accompany the writing I chose four works from a series in progress, Greenlandic Flag variations. (Snapped with my iPhone. The moire pattern comes from the open weave of the curtain material, which is a bright burnt orange.) I hope you'll take a look to learn about some new directions in my thinking. Here's the link. While you're there, you'll want to bookmark the Artists and Climate Change website, it's a useful resource, with interesting and timely content from around the world. Pecha-Kucha is a fast-paced and FUN live presentation format. Strictly auto-timed for 20 slides, 20 seconds each, the speaker is at the podium for exactly 6 minutes and 40 seconds. I recently participated in a Pecha Kucha program at DaVinci Art Alliance in Philadelphia. Our program consisted of two groups of 5 presenters, with a short break in between the groups. A 10 second pause between presentations allowed for brief applause before the next speaker started right in, slides rolling. A high energy event! I spent an inordinate amount of time preparing my talk...it's not as easy as you might think. Nevertheless, it's a really useful exercise. I try to make the most out of any opportunity to address a room full of willing listeners, so I thought long and hard about what I wanted to say. Self-reflection helps me focus on the deeper influences, motivations and values that both anchor and propel my mission. Below is the recorded version of my new Pecha Kucha talk - We Live by Art and Reason. Enjoy! Want to hear the Pecha Kucha that I presented at DaVinci in 2015? Here, click the link. It shows some the evolution of my thoughts about place and self, an ongoing project. Uploaded by Andrea Krupp on 2016-12-09. Snorri Sturluson stands just outside my window. I catch glimpses of him from the corner of my eye as I move around the apartment. He is still, but it's as if he just stopped for a moment, a book under his arm, his thoughts elsewhere. Though I came to the Snorrastofa with a great enthusiasm for old books, history and all things Icelandic, I really didn't expect to become so thoroughly enamored with this man Snorri and his writings. But that's what happened. Word by word, bit by bit, I am making my way through the Gylfaginning section of Snorri's Edda. I have been using Anthony Faulkes' painstakingly researched, compiled and transcribed version, an absolute tour de force of scholarship and research. I'm reading his translation of Snorri's Egil's saga. And finally, to give context to all this information, I'm reading a wonderful new book about Snorri by Nancy Marie Brown called "Song of the Vikings." See links below. I love getting to know this person from the past whose writing preserved, shaped and informed a wonderful aspect of our, humanity's, cultural heritage. My creative self thrives in this immersion into language and history. I let the words wash over me. They bring me to a deeper understanding of Iceland and its history, and that perspective influences the way I perceive the Icelandic landscape. Thank you Snorri. And thank you historians and scholars who created resources that allow me to peek into this rich past. The contemporary writer Nancy Marie Brown's recently published book "Song of the Vikings - Snorri and the Making of Norse Myths" has been an invaluable guide through this experience. I am excited that I'll have a chance to meet her later this week when she will bring a group of visitors to the Snorrastofa on a tour of the region's Saga history. Here is the website for the company that hosts her tours, and here is a link to her book. Here are some new drawings from my days at Snorrastofa. I am coming slightly unhinged, everything is out of joint. It's all because of the sun. It has been a sleepless month, this June in Olafsfjordur, North Iceland, at the Listhus artist residency. The light of the sun on a foggy, overcast day, is constant all through the day and night. On a clear bright day time seems to stand still, only subtle clues to tell the hour. Nine pm, midnight, three am: white nights, with no darkness to frame the end of one day and the beginning of the next. This has been a unique experience, the Arctic summer, but I am exhausted by it. It's a different kind of sleep -- fitful, not deep sleep, but shallow, illuminated by a pale light that filters through the eyelids. I sleep, and dream, but close to the surface of consciousness, and my dreams are thin and thready, suffused with a subconscious awareness of uncanny light when it ought to be dark. It is the strangest thing. Without the clues of fading light, desire for sleep comes only through force of will. So one goes outside, walking in the midnight sun, and it is weird, beautiful. But freed from the natural boundaries that divide day from night one must at some arbitrary point say, OK, this day is now done, I have had my fill of this day. Eventually one must give in. We need sleep and immersion into the dark unconscious to start another day with renewed vitality. This darkness deficiency is manifesting itself in my artwork, I think. I am working in black and white. 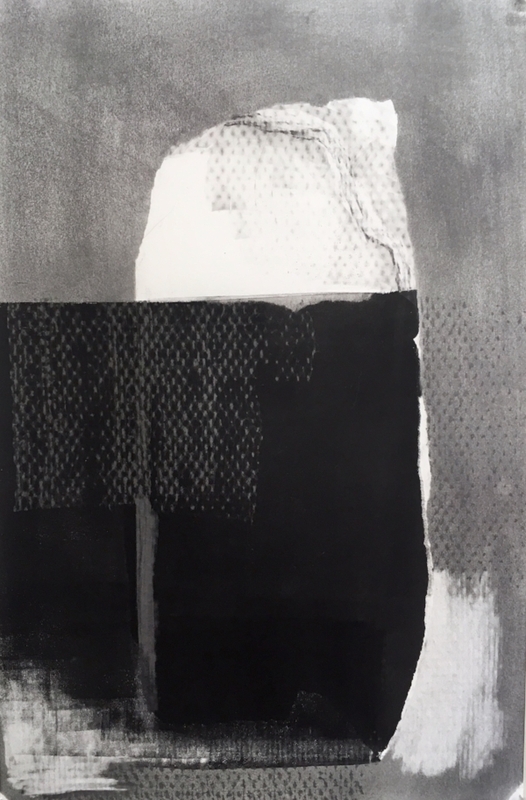 In my new collages, deep black represents both earth and air. Black is stabilizing, and restful, and gives my eyes something to sink into. The ever present sunlight, especially from behind a veil of shifting fog and clouds, is finding expression in erasures, smudges and the shimmery grays of graphite. This Friday, July 1, I will shift gears and begin a three week residency at the Snorrastofa, in Reykholt, West Iceland. A different kind of landscape, an area not dominated by mountains, but instead suffused with Saga stories. It will be an immersion into words and history. I wrote about this residency in a previous post. Click here for more. Bly’s words are a serendipitous echo, as I’ve been musing on the same things lately - silence, transmission, connection. I began this train of thought, especially about words, and about how we connect to the past, during visits to the National Library of Iceland in 2014 and 2015. The woodcuts pictured above are my initial response to the manuscripts I was working with in September 2015. Through handling and studying those historic objects, through the very fact of their existence in the here-and-now, I felt connected to the past in a way that was very affecting. The books themselves, no less than the words they contained, transmitted something from the past. It's in our nature to try to understand the implications of our lives, and make meaning out of our momentary presence in the Universe. As a visual artist, my goal is to contribute to our understanding of these things, or at the very least, serve as an amplifier of silence, and a transmitter of experience, memory and spirit. In July I will continue my research at the Snorrastofa historic archive in Reykholt. Scholars come from around the world to study Icelandic manuscripts that were written, or at least compiled, by Snorri Sturluson in the early 1200s. Snorri's words will transmit loud and clear from the past, I have no doubt. Especially from the amplified silence of a library that sits right on the edge of a vast wilderness, essentially unchanged (I hope) from what Snorri would have seen. I am excited and honored. Heitir undirhyggja, vélræði, fláræði, brigðræði. It is called subtlety, wiliness, falsehood, fickleness. Time is present in Iceland. It is in the silence, which contains all of time within itself. Time is transmitted through the Earth, made visible in the accretions and erosions, the tearings and torrents that shape the landscape. Walking along ancient footpaths, deep trodden by Vikings, I experience time flowing through me. These are some of the thoughts and ideas I explore in a series of large drawings made during my 2015 residency in Iceland. Jökulhlaup 25" x 38" Graphite on paper A Jökulhlaup is a destructive torrent of ice-melt, caused by a sub-glacial volcanic eruption. Wilderness is the part of nature that is hidden and terrifying. Every being shares this awe of nature, knowing that it will bring us all to our knees in the end. Icelanders know it, because living at the Northernmost edge of the habitable world brings with it a certain humility. In the wilderness HIC SVNT LEONES, trolls, outlaws...our very shadows. If landscape can function as a mirror of self, for me it does, then wilderness stands for the parts of myself that are unknown to me. At the beginning of the 21st century, consciously or unconsciously, we collectively mourn the irretrievable loss of wilderness on our planet. And not only that; we mourn mass extinctions, loss of habitat, loss of bio-diversity and the effects of global warming. We need wilderness, both actual and metaphorical, in order to know our frailty and face our mortality. I believe that this knowledge brings an important sense of perspective to our daily lives. It informs the choices we make in the day to day - how we spend our time, what we consume, and what we wish to leave behind. Time hangs in the air, like a ball reaching the top of an arc, and the present disappears into the past. Melancholy billows up out of the silence as we acknowledge the ephemerality of this moment, this life. Side note: I will be exhibiting drawings made during my October 2015 residency in Iceland, as well as woodcuts, at Cerulean Arts Gallery, March 2-26, 2016. I hope you'll join me and co-exhibitor Roger Chavez for the Opening Reception on March 4, and our Artists' Talk on March 13. Click through for details. This short poem has been circling in my imagination. It's an old familiar rhyme for many Icelanders, written in the mid-nineteenth century by Kristján Jónsson Fjallaskald (1842 - ­1869). Some of the attraction is the sound of this beautiful language, the inherent veil of incomprehension, and my willingness to be absorbed by sound and mystery. I have a sense of what the words mean, but I love also what is left untranslated, and what shimmers at the edges of comprehension. Here it is in Icelandic and my own rough translation. Yfir kaldan eyðisand einn um nótt ég sveima. Nú er horfið Norðurland, nú á ég hvergi heima. Across the cold wasteland (of sand) one night I flew (glided). Now the Northland is gone (lost to me), now I have no home. Woodcut, 12 x 9. The reflective area on the bottom is printed with graphite ink. Here in Iceland, working in the studio I sometimes feel utterly lost as I leave behind the comfort of the familiar. I am OK with that. The theme I am contemplating is eternal, universal, and gets to the heart of the human condition: we all walk alone into the darkness eventually. I'm comforted by this voice from the past, a solitary soul striking out into the unknown. Here is a link to a YouTube video of the poem set to music, sung in haunting harmony. Enjoy! As the Ravens return to Iceland, it's the end of September and I find myself on the verge of transition. My month at SIM is over, and tomorrow I head North to Akureyri. Before I leave this spot, here are a few pictures from my month at SIM Reykjavik. Lava and moss in the Gálgahraun lava field near Reykjavik. Detail of a painting by Kjarval. View from my window. I am talking to you. Ancient rock wall, a sheep enclosure in Þingvellir. I am talking to you. Woodcut, 10" x 13"
View from my studio at SIM. The fantastic September SIM cohort: Tim (thanks for the photo!) Genevieve, Alec (in front) Eva, Sophie, me, Lydia, Elia, Camilla. Missing from the photo are Jonathan and Natalia. For more info about our doings, look on the SIM Facebook page "Simresidency." In Iceland, silence is much more than just a space between sounds. Silence is time moving backwards and forwards. Silence rises up from the earth, the atmosphere is charged with it. Silence in Iceland is a dizzying aural experience. In Iceland, I feel both connection and loss as I stand in the silence, witness to the passage of time. Lbs 2294 4to. I took this picture in 2014 during my visit to the manuscript collection at the National Library of Iceland. Words are coins whose value is confirmed or subtly changed every time they change hands. Blámi/blueness series in progress 9" x 12"
In March, Philadelphia artist Bill Brookover gave a presentation at the Print and Picture Collection of the Free Library of Philadelphia. Bill has been doing research in the collections and is helping to raise the visibility of the holdings there. He assembled a group of lithographs by Arthur Flory and woodcuts by Abraham Hankins, both active mid-twentieth century, to highlight the oeuvre of these two Philadelphia printmakers. Among the artwork on display was this black-line relief print by Abraham Hankins. I was instantly drawn to the opaque, textural and painterly surface, printed on black paper that casts a veil of darkness over all. With this treatment, the cut-out lines reverse to read as scrawled black lines. The gouged-out would-be negative shapes transform into substantive black marks by the reversal. Seeds of inspiration, and investigation, settled into a deep fold of my creative brain. Sometimes things just just fall into place. Some weeks after Bill's presentation, I Googled "black-line woodcut" and found some amazing and inspiring works by Anne Ryan, ca. 1945, among others. It appears to have been a technique favored in the 1940s-60s. I love the mid-century aesthetics and I have many nostalgic associations with the whole gestalt of the period. It was like discovering buried treasure. Anne Ryan Fruit on a White Plate, ca. 1945. 17" x 17", edition of 30. Here is a link to a NYT article about her work. I am fortunate to have stumbled upon this printmaking technique at this juncture. For the past few weeks my experiments with paper and inks have been both fruitful and frustrating, but that's the way it always goes acquiring new tools and learning to use them. I am beginning to get a feel for it. I want to express the tenebrous atmosphere of winter in North Iceland and colors that emerged from the darkness. I want to capture my experience of connection to Icelandic place, and to the ephemeral here and now.